Heat Transmission Thermals There are 2 products. 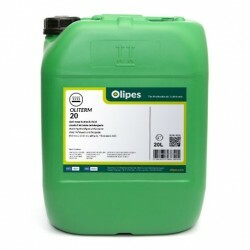 Oliterm 20 is a mineral heat transfer oil, paraffinic structure, and highly refined, whose additives provide it with great thermal stability and resistance to oxidation for use in indirect heating and cooling systems. Oliterm 30 is a heat transfer, paraffinic structured and highly refined mineral oil, whose additivation gives it great thermal stability and resistance to the oxidation for its use in heating and indirect cooling systems.